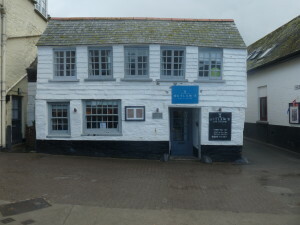 Nathan Outlaw’s Kitchen at Port Isaac was a revelation. Seafood cookery that is brilliantly fresh (the evening’s fish delivery arrived whilst we were lunching) and incredibly good value for money (set menu £15pp) without any pretension. The cuttlefish croquettes were served with grey mayonnaise, presumably from the cuttlefish ink – what a great touch. And oh, those Cornwall beaches. Faced with today’s downpour, and with no sign of immediate let-up, I donned the waterproofs and got on with the essential task of harvesting the borlotti beans. Note – it is a TERRIBLE idea to harvest something meant for drying in the pouring rain. But leaving them any longer gave the risk of rot. So a sackful (no exaggeration) of beans is now languishing on old newspaper on the spare bed. If they don’t dry off by morning I’m going at them with the hairdryer. I came home sodden. Time for emergency gingerbread. This recipe comes from an old client, Bill Sewell, who I was fortunate enough to work for when he opened his cafe at St Davids Cathedral in Pembrokeshire. It’s incredibly easy, really tasty and keeps brilliantly. Ideal for wet autumnal afternoons. Preheat oven to 180 celsius. Line a 2lb loaf tin with baking parchment. In a small pan, gently melt together 100g each of treacle, golden syrup & light brown sugar and 300ml milk. Leave to cool. The milk may separate, but no matter. Measure 225g self-raising flour in a bowl with 1tsp bicarb of soda, 1tsp cinnamon, 3tsp ground ginger and a good grating of nutmeg. Rub in 100g butter until well combined. Add the wet ingredients to the dry and give it a good stir until it comes together as a batter – I just use a wooden spoon. Beat 1 egg in the (now-dirty) milk pan and stir it in. Pour the lot into the prepared tin and bake for about 45mins, until done. Gingerbread keeps brilliantly and gets better with age. Keep in a tin for future rainy Mondays. This entry was posted in Recipes, Sweet and tagged Bill Sewell, Borlotti beans, Cream Tea, Gingerbread, Nathan Outlaw, National Trust. Bookmark the permalink.